A walk through Saratoga Springs’ today reveals glamorous buildings of distinct styles that range from simple red brick facades to decadent Victorian mansions and even southern antebellum porches that make you question how a hint of southern hospitality made it so far north. Fine dining is everywhere you turn, and a horse will always be displayed to remind you of the track. Behind the city’s current lively atmosphere of health, history, and horses lies a complex history of urban development. Planning maps dating from the city’s earliest years to today reveal this history in the way they have changed since the early 1800s and shaped the city into what it is today. 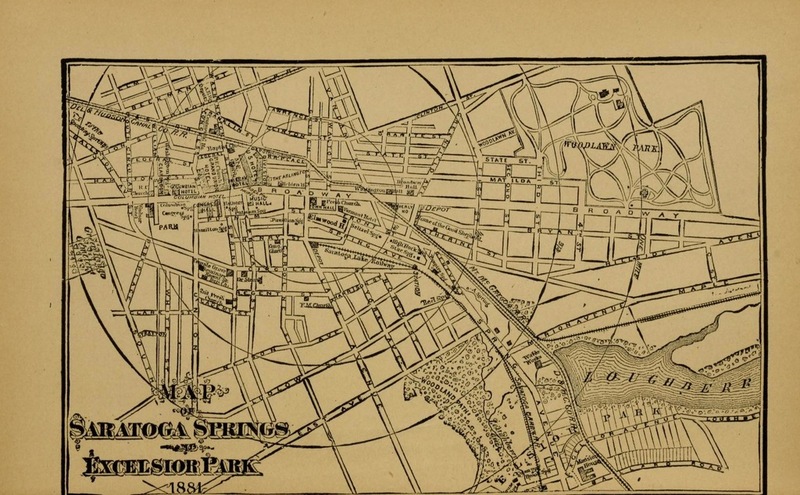 The first trend of urban development in Saratoga Springs in the 19th century relied upon the foresight and hard work of industrious entrepreneurs who saw potential to profit from the area’s many resources who used maps to plan and record development. As the city grew in the early 20th century, it experienced setbacks, such as the financial woes expressed in the Commission Report from 1915, but managed to pull through. As it did, the city and its maps began not only to focus on growth but on improvement of the current structures. These improvements began in the late 1940’s, when Saratoga Springs began to look to the future. 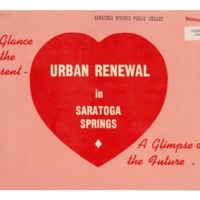 By the early 1960s, Saratoga Springs began a third phase of urban development that concerned itself with beautification and renewal of blighted public spaces. Saratoga Springs remodels and expands itself until the mid 1980s. The story of urban development helps us understand Saratoga Springs’ tenacity and commitment to promote growth and respond to decay in its urban space with purposeful development and lucrative renewal. By the late nineteenth century, developers in Saratoga Springs were seeking ways to entice visitors and residents to develop beyond the central artery of Broadway and its upper village at High Rock Springs and lower village centered on Congress and Columbia Springs. Despite the best laid plans, however, some ideas never made it past the drawing board. This 1881 map of Excelsior Park by developer Henry reimagines and updates a map by town surveyor Louis H. Cramer in an effort to entice people to leave the “crowded hotels” of Broadway and purchase year-round residences a mile north of downtown. 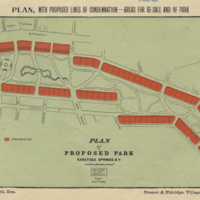 The scheme was unsuccessful, but the map offers a nineteenth-century example of a dream to develop an off-Broadway area whose bridle and walking paths with “romantic woodland views” were already an attraction that put similar maps of Excelsior Park into guidebooks. Of note, the lake formerly known as “Owl” and “Excelsior” appears with its current name—Loughberry Lake. 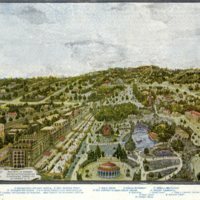 Nineteenth-century planning was both art and science: In 1894, at the height Saratoga Springs’ Gilded Age success, a pictorial map and plan appeared in a supplement to the Daily Saratogian, proposing a grand new park to run parallel to Broadway. Although this vision never came to be, reformer and Saratoga Springs summer resident Franklin W. Smith’s designs (executed by the Albany Engraving Co. and village surveyors and civil engineers Louis H. Cramer and Thomas Eldridge) colorfully suggests many fanciful and imaginative attractions, including an early plan for a public library as well as exotic restaurants and animals, new public spaces, leisure activities, and additional accommodations. 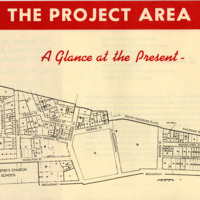 Zoning and development maps tell a story of rejuvenation and change in the city of Saratoga Springs since the mid twentieth century. Every ten years, starting in the 1960s until the present, Saratoga Springs' authorities develop and change the city's Comprehensive Plan, a move that indicates a constant interest in promoting growth and change. 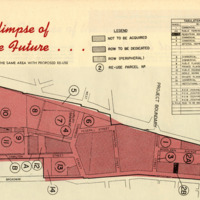 These maps reveal a city that is always looking to the future and always seeking to re-invent itself to maintain and burnish its reputation as a good place to live and the vacation center of the northeast. 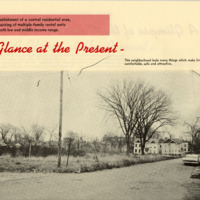 The 60s in Saratoga Springs was marked by this need for change to combat years of previous decline.Saratoga Springs fell into a period of decline after World War II and urban renewal was the clear response to update the city’s reputation. The Federal Housing Act of 1949 set a standard for American cities to be beautiful and aesthetically pleasing. As cities across the country at this time were seen as centers of urban decay, an economic boom generated the funds for rebuilding. Federal subsidies allowed local governments to invest in urban renewal projects and in turn local governments receive money for public infrastructure.